WASHINGTON (CNS) — The Catholic Church pulls out all the stops for the Easter Vigil, the Mass celebrated on Holy Saturday. That quote, “mother of all vigils” comes from St. Augustine’s Sermon 209, which is pretty old, since the saint died in the year 430. In other words, the tradition of the Easter Vigil and support for it, goes way back in the church. But there was a falling out over this tradition for a long time and only in the 20th century did the church recover what “got lost in the Middle Ages,” said Jesuit Father Bruce Morrill, the Edward A. Malloy professor of Catholic studies at Vanderbilt University Divinity School in Nashville, Tennessee. The priest said the vigil’s origins were in the early fourth century, but by the late Middle Ages, the celebration moved from a nighttime vigil to a Saturday morning Mass. Also around this time, the church also placed more emphasis on infant baptism than adult baptism. It became the norm until the liturgical and sacramental renewal of the Second Vatican Council led to a revival of the ancient catechumenate with the Rite of Christian Initiation of Adults. 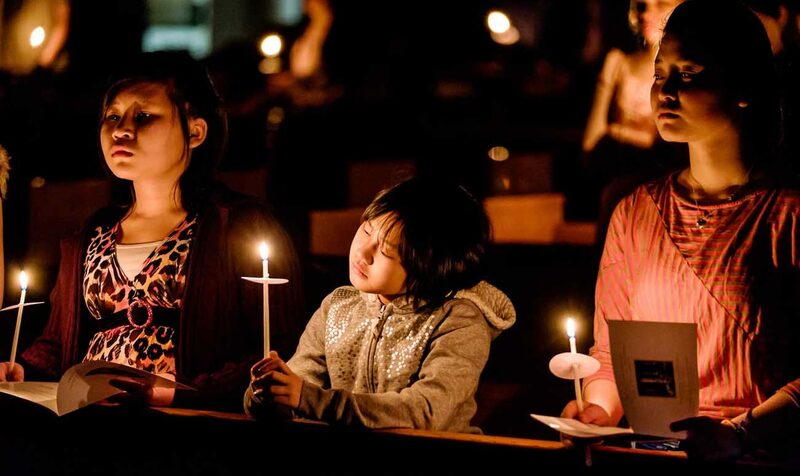 But even before Vatican II, the move to revive the Easter Vigil began with Pope Pius XII in the 1950s restoring the celebration to the Saturday night before Easter and making additional changes. Father Morrill said documentation of the ancient church celebrating the Easter Vigil in Syria and North Africa notes that the sacraments of initiation — baptism, confirmation and first Communion — took place in a separate area while the congregation listened to words from Scripture and then the newly baptized were brought out to the congregation. “It was very elaborate,” Father Morrill said. “If you wanted to see the risen Christ, you saw him in the newly baptized.” And that symbolism continued after Easter. For the next eight days, the newly baptized were required to wear their white baptismal gowns to daily Mass where the bishop would give instructions about the meaning of baptism. And even though the newly initiated no longer wear their baptismal gowns for a week, baptisms remain a very key part of the Easter Vigil. “In fact, a vigil where no one is going to be initiated kind of falls flat,” the priest told Catholic News Service April 5, noting that all the readings lead up to it. The Easter Vigil is loaded with symbolism. It must take place after dark and begins with the lighting of the fire outside and the inside lighting of the Paschal candle, whose light is passed on to individual candles. There are seven Old Testament readings telling the salvation history, sung responses between readings and a sung proclamation called an Exsultet. The Mass also includes the baptism, confirmation and first Communion of catechumens who are joining the church, having prepared for this moment through the RCIA. Candidates, who are already baptized, receive confirmation and first Communion at the vigil to enter full communion with the church. He said the first part of the vigil, gathering around the outdoor fire, is reminiscent of being around a campfire, telling stories, which in this case are the stories of salvation history. The congregation is “not waiting, shivering cold in dark” but is reminded by the fire that “God has always come to our aid.” And then during the Mass, the readings continue this story, from creation to the Israelites’ flight from Egypt and the message of a messiah from the Old Testament prophets. When Father Rice hears people say the Easter Vigil is just too long, he says it doesn’t matter if it’s two or three hours because it is so rich. Part of the reason so many people love the vigil, he told CNS April 6, is that it “hits us on a primal level.” Today, people rarely keep watch through the night, nor do they tell stories. He also said the vigil is a sensory experience with the smell and the crackling of the fire, the music between readings and the stark images of darkness and light. “That spoke to me so powerfully of the power of light to drive out darkness,” he said, in a way that he hadn’t experienced before or since. Father Morrill’s most profound Easter Vigil experience came from a student. When he was teaching at Boston College, the priest assigned his students to attend and write about two Sunday Masses or one Easter Vigil. One student wrote a 10-page paper about his experience at the vigil where he felt his broken life was renewed and he was given new hope. The student was moved right from the start with the symbolism of the fire lighting the darkness. Then he felt the readings were not just about what God had done but was still doing today. Father Morrill saved the paper and has kept in touch with the student. He said if no one else got anything from the experience, he would still “thank God for the privilege” of leading one person there that night.